Even though NTR’s Nannaku Prematho and Balakrishna Nandamuri’s ‘Dictator’ are supposed to clash at the box office, it was only seen as professional rivalry until the recent act of NTR which revealed the personal rivalry too. At the audio launch event of NTR’s Nannaku Preamtho, Sr NTR and Balakrishna’s banners and posters were expected to be put up as a general courtesy. 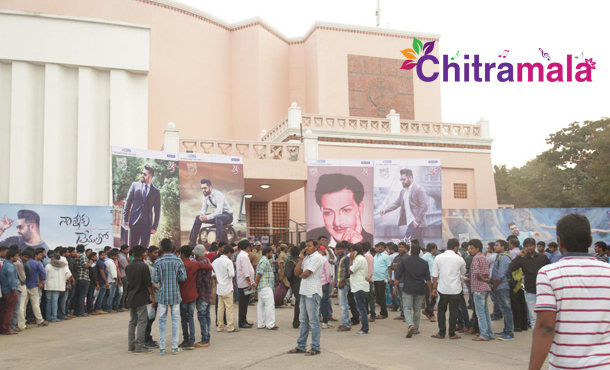 However, Sr NTR’s posters were put up but not Balakrishna’s. NTR has sent a clear message that he doesn’t surrender before his politically powerful Babai who has the support of TDP.This act of NTR clearly denoted the internal war between the duo. Common fans are of Nandamuri family patiently wait for the reunion of two their favorite stars but doesn’t seem to be happening any sooner. Balakrishna’s Dictator and Jr NTR’s Nannaku Prematho movies are releasing on Sankranthi festival.